Hospital birth with some unexpected twists -- Lyla's birth story. When I think of Taylor and David, the words that come to my mind are strength, determination, and love. In the months leading up to their guess date, as we met up to discuss their birth plans, I learned that they were both avid mountain bikers, hikers, and lovers of all the wonderful outdoorsy adventures Colorado has to offer. They desired a birth that was as natural as possible, and we talked about ways to help this happen. 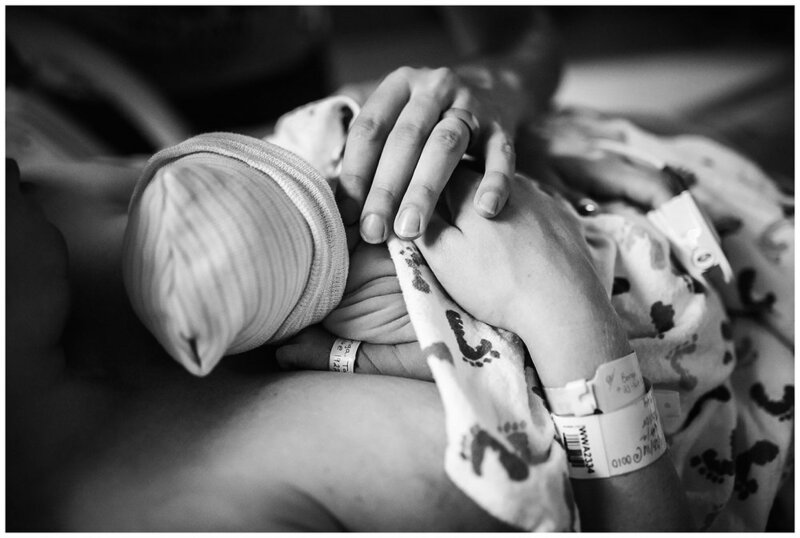 They had also asked me to capture photos of their birth, and I was excited to get to document their story. One evening, Taylor texted me to let me know her water had broken and she was heading to the hospital. Labor wasn't kicking in on it's own, so around 4am, the doctors decided to start her on pitocin to help things along. By around 8, things were intense enough that Taylor asked if I could head in. Despite being tired, Taylor was working through contractions beautifully. She and David had joked about labor being like a particularly difficult bike trail they had once climbed, and I could tell that the mental determination and physical strength Taylor had gained through mountain biking was truly paying off. Within a few hours, Taylor had progressed from 4cm-9cm. We all thought baby's arrival was right around the corner, and although contractions remained extremely intense, several more hours passed without any significant change. After being up all night, Taylor was reaching the point of utter exhaustion, and finally opted for an epidural so she could get some rest. As the sun was setting, it was finally time to push. Taylor gathered her strength and pushed for over three hours before baby Lyla decided to make her appearance. David was right by her side, encouraging her on the whole time -- they make an amazing team! Baby Lyla was placed on Taylor chest immediately, but was a little stunned after the birth and needed a little extra help to start breathing on her own. Things were a little intense initially, but thankfully she soon began to pink up and cry on her own. Taylor also experienced some medical complications, but thanks to a great staff, both of Taylor and Lyla were soon stabilized and able to be reunited. Taylor's two sisters came in to see her soon after the birth. The bond between these three is so strong and beautiful -- it was such a special moment to document!